본 연구는 아동부양가구에 대한 소득보장정책에 있어서 아동수당과 조세지원정책의 양자 모두를 종합적으로 고려하면서, 한국에서의 아동수당 도입 방안과 조세지원제도들의 대체 문제를 검토하였다. 이를 위하여 주요 국가들의 사례를 비교 분석하고, 또한 대안 모델에 따라 소득계층별로 급여수준의 변화를 분석하였다. 분석결과 다음과 같은 시사점을 얻을 수 있었다. 첫째, 한국의 아동부양가구에 대한 소득보장정책은 이제 인적소득공제 중심의 역진적 체계에서 벗어나 아동수당 중심의 누진적 체계로 전환해야 한다. 둘째, 아동수당을 도입할 경우 소득수준에 관계없이 모든 아동에 급여를 제공하는 보편적 아동수당이 적절하다. 셋째, 조세지원정책 측면에서는 중산층 이상이 주된 수혜대상인 인적소득공제 및 비환급성 세액공제제도는 폐지하되, 저소득층 및 서민층에 대한 지원제도는 존속시키는 것이 필요하다. 넷째, 중장기적으로 근로장려세제를 중산층에 대한 지원체계로 까지 대폭 확대하는 것을 고려해야 한다. 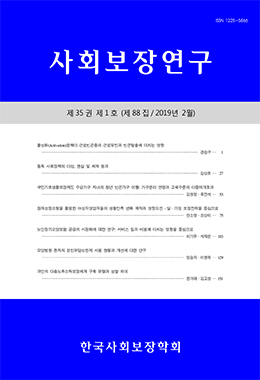 This study explores an introduction of a child allowance and reform alternatives of tax expenditure systems with regard to income support policy for the households with dependent children in Korea. To do this, this study analyzes the cases of Sweden, the UK, and the US and compares them with the Korean case. And then this study also simulates the changes of benefits according to 8 different alternative models. On the basis of the results, this study suggests the following policy implications. First, the current Korean income support system needs to transform from the regressive income deduction system through the tax expenditure to the universal progressive system by introducing child allowance programs. Second, the favorable form of child allowance is an universal system. Third, of the tax expenditure programs, the income deduction and the non-refundable tax credit program needs to be abolished, while the refundable tax credit programs are sustained. Fourth, in the mid-to-long term, the EITC needs to be enlarged to include the middle class.